Writer-director Debra Granik made her feature debut with Down to the Bone (2004), a stark working-class drama with Vera Farmiga giving a breakout performance as a coke-addicted young mother. Farmiga has since moved on to more upscale projects, but with this second feature Granik steps even farther down the economic ladder, to the piss-poor Ozarks. A 17-year-old girl (Jennifer Lawrence) struggles to care for her mentally incapacitated mama and two younger siblings. The situation grows even more bleak after her daddy, busted for cooking crystal meth, signs their home over to a bail bondsman and then disappears; she needs to find him before the family is evicted, but the murderous meth dealers he supplied want him to stay lost. The social detail of a 21st-century mountain community is completely persuasive, heightening the drama immeasurably; the movie wouldn't be half as suspenseful if Granik hadn't sealed us into this little envelope of wilderness and poverty. With John Hawkes. 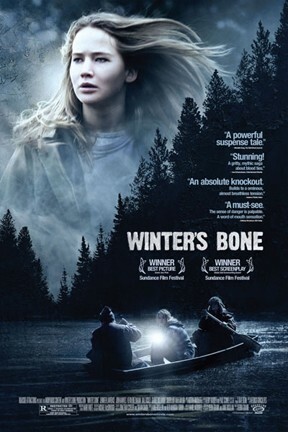 Winter's Bone: A Tough, Poetic Indie Gem. Winter's Bone is not showing in any theaters in the area.